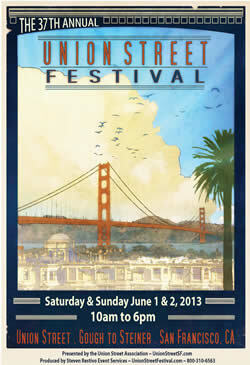 In its 38th year, The Union Street Festival is one of San Francisco’s largest free annual events, launching the city’s summer street festivals with an atmosphere of open-air market and traditional fair ware in the heart of historic Cow Hollow, San Francisco’s premiere shopping and residential district. Featuring over 150 boutique artists from across the country, the Festival offers opportunities to browse and buy jewelry, pottery, paintings, photography, furniture and bath & body supplies while providing entertainment by the best of the Bay Area’s hardest working Indie bands. Adding to the atmosphere of the Street Festival, over two dozen gourmet food booths and bistro style cafes plus multiple beer gardens offer nourishment while visitors absorb the sights and sounds.